I don't often go into Croydon, despite the ease of access on the tram. I find its street layout confusing and (lets be honest) it's architecture pretty hideous. From the top of the shopping centre car park you can see how the taller buildings seem to have just been plonked down or built up, without any consideration given to how they fit the landscape or the roads around them, and at ground level the older buildings - many of which were clearly attractive once - have been chopped about mercilessly. Then both, of course, have been left to get tired and grubby. That said, there are some interesting murals and stained glass windows if you look for them, and the museum (which is free) is well worth a visit if you're in the area. I had it to myself on Friday, although the library and cafe in the same building are very well used (and it's an attractive well-lit space that doubles as a gallery too). It's also one of the few places which still has some independent shops hidden away - clothes stores, electricians, drapers. Although that does mean there are sometimes rather odd things for sale. 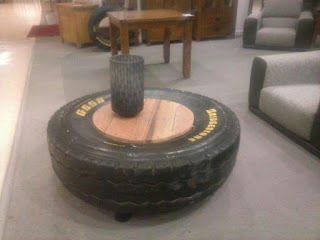 Like this coffee table, for example. But that too is at least interesting. So fingers crossed the regeneration being planned now is done with a bit more care than some of the previous attempts.